Anyone who complains about Phoenix traffic has never lived in a city with real traffic issues. You could move down here to Yuma - where 'peak hours spent in congestion' hovers around '2'. What about Mexico city... It is in North America. On the other hand, living in Phoenix in the summer has approximately the same weather as the surface of the sun. I've never figured out why Phoenicians don't go for more covered parking. Heat is manageable with air conditioning (as long as you don't like being outdoors), but baking your cars like that is just pure masochism. Dallas is twice as big as Seattle and Houston is three times as big. The Dallas and Houston urban areas are both growing nearly twice as fast as Seattle’s, but Seattle is concentrating its growth in the city while Dallas and Houston allow more people to settle in the suburbs. INRIX found that congestion was worse in Seattle than either Dallas or Houston, which was a direct result of Washington’s growth-management policies. 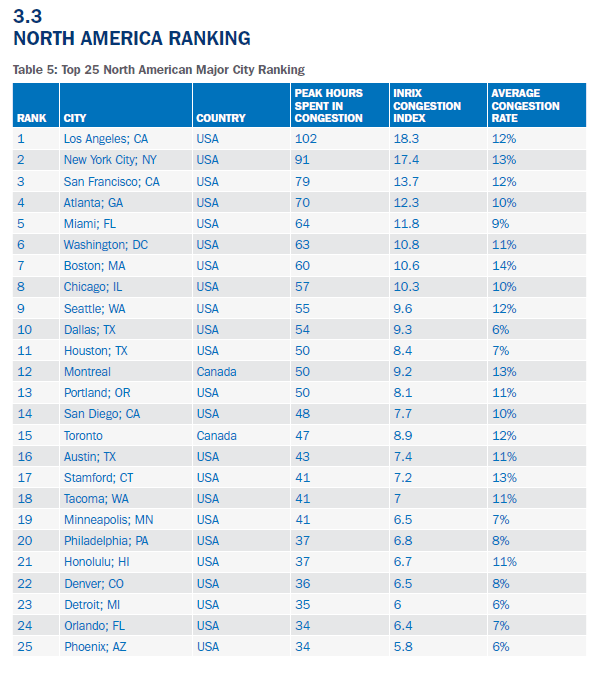 San Antonio’s congestion ranking is particularly impressive, as it has about half the congestion of Seattle even though it is more than twice as big. San Antonio is the seventh-largest city in America, while Dallas is ninth and Seattle is twenty-third. But, unlike Seattle or even Houston, San Antonio hasn’t concentrate people or jobs in its downtown area: Seattle and Houston both have almost three times as many downtown jobs as San Antonio, which makes them more congested. Much of this has to do with the fact that the streets in the Phoenix metro area are in a grid pattern with synchronized signaling for the most part and as the suburbs expanded the grid system was expanded and generally widened so that traffic peaks then rapidly drops off during the morning and afternoon rush hours. The older parts of the Phoenix area that have lots of side streets on the major streets have worse congestion than the newer developments that have only side streets every 1/4 mile or so. Its one of the design features that I miss having moved to Western New York. They simply cannot comprehend why adding a 6 lane boulevard with a landscaped median and intersections every 1/4 mile makes more sense from a traffic congestion stand point than downsizing it to make it pedestrian friendly. No, it has to do with road building. The Valley builds roads like it's going out of style. Wide, huge, roads. They even build roads that are redundant to others....etc. Travel through the Valley of the Sun someday and marvel at all the nice roads. REALLY nice roads. It's one reason I love where we live (in Gilbert) because heavy traffic is essentially a non-entity yet we're just 10 or 15 minutes away from any possible event or retail desire you can imagine. Most times, 5 minutes away. Case in point... Loop 202 is being built and quickly I might add. It wasn't necessary. Most cities would have just kept using the same roads to get from Point A to Point B and just stomached the increasing congestion. Not Phoenix. Light rail is a vanity project, essentially. And it has no significant impact on traffic levels in the Phx Metro area. Light rail is a colossal waste of taxpayer money. Wanna see what advanced planning looks like? Go to google maps via the below URL and then pan around. This is a new extensive highway interchange and you'll see that it's basically in the middle of nowhere, relatively speaking. Because Phx builds roads for the future. Not to play catchup. The heat is really misunderstood by the uninitiated. Yes, from late May to early Sept, it's downright hot. No doubt. But when the sun goes down, it's amazing. Night life is incredible. Backyard and indoor/outdoor living is beautiful after the sun goes down. That's during the summer. Then for the other 8 months of the year, indoor/outdoor living can be done almost daily, save for a small period in Dec and Jan where you might need a sweater in the evening or morning. No bugs to speak of. It's absolutely gorgeous. So don't let the "too hot" non-sequitur distract you from the truth. Living in the Valley of the Sun is absolutely amazing. I wouldn't call anywhere else home. Exactly. Moving from Oregon to Arizona was like night and day when it came to the roads. Oregon is determined to drive all citizens to any transportation other than cars. So it impacts all facets of life... negatively. You couldn't pay me a million dollars to move back there. I literally grew up watching them build it all and I LOVED IT. In 1994 they had Prop 205 for Maricopa County to pay for all the freeways. My parents were dead set against it, but I told them as an 11 year old kid that they should vote yes for it as its going to be needed and I was right. Then I grew up and moved to Western New York when I turned 21 and the difference was very depressing. The infrastructure is badly designed and poorly maintained yet nobody wants to change it. They complain about the noise and the distraction bigger streets create but I had been on many major streets in Phoenix and I know from experience a good street and road system traffic noise becomes a non issue after 7pm. Then they argue that there's too much historical value being destroyed trying to fit wider streets into such an old city like Buffalo and that's when I usually agree with them. As amazing this city was at one time, its legacy is in its architecture. Many many works of art would have to be destroyed to retrofit this into a city like Buffalo but I explain most of my suggestions are for the easier redeveloped like the inner suburbs. It wouldn't make sense to destroy good history to make the city transportation system better as that's the exact thinking to made the city as awful as it is for traffic. I like to explain that Phoenix is the culmination of decades of learning from successes and mistakes in urban planning from both the West Coast and East Coast.